Would you survive the black plague? Yes, the more outside my house the worse it will get! How wealthy are you/is you're family? Poor, how the heck to I have money to have to computer/phone to do this quiz! Is there a garbage can in you're bedroom? How is you're faith in God? What does you're normal dinner look like? How much do you keep the door open in you're house? I keep my door shut, but I like to have the windows open. I keep the windows and doors shut most of the time. Why would I do that? I can't do anything, its not my job, and I don't want to get sick. How often do you wash you're hands? Have you ever seen a rat/mouse in you're home, or ever had a problem with them? LAST QUESTION: If you're city was sick would you leave or stay? You would live for a week after it stuck you're town. You would live for about two weeks after it stuck you're town. You would live for 2 months after the disease struck you're town. You would die soon after it struck. 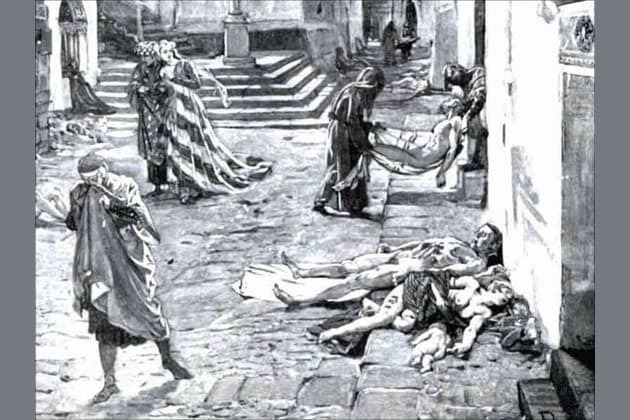 Take this quiz to see if you would survive one of the most notorious diseases of the 14th century.